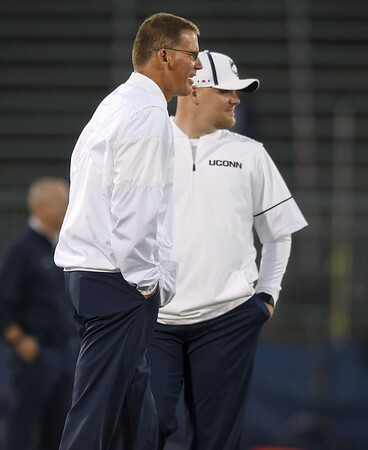 NEW BRITAIN - A Connecticut judge heard arguments Wednesday about whether UConn football coach Randy Edsall should be allowed to retain his son as an assistant coach with the team. Edsall is appealing a ruling by the state Citizen's Ethics Advisory Board that the school violated Connecticut's ban on nepotism by hiring Corey Edsall in 2017 as the school's tight ends coach. Corey Edsall has been allowed to keep his job during the appeal process. Judge Joseph Shortall did not issue a decision after the hearing in New Britain Superior Court, and it is not clear when he will rule. UConn President Susan Herbst testified during the hearing that the ethics board's decision “could put a black cloud” over the recruitment of professors, deans and graduate assistants, The Hartford Courant reported . Randy Edsall is in his second stint as UConn's football coach, being rehired last year after Bob Diaco was fired. He also coached the Huskies from 1999 through the 2010 season, going 74-70 and winning the Big East titles in 2007 and 2010 and taking the Huskies to the Fiesta Bowl in his final season. Corey Edsall also was hired in 2017 on a one-year, $95,000 contract. In response to the ethics board's ruling, state lawmakers earlier this year inserted last-minute language into a bill on state computer records that allows immediate family members to work in the same “constituent unit” of the state system for higher education with certain conditions. The bill, which upset ethics officials, was approved unanimously. The state attorney general's office, which is representing UConn in its opposition to the ethic board's ruling, wrote in a brief that the new state law permits Corey Edsall to keep his job. Posted in New Britain Herald, State on Thursday, 6 September 2018 21:53. Updated: Thursday, 6 September 2018 21:56.